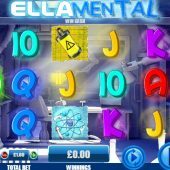 Ella Mental slot is simply a play on words of 'elemental', so some science connections going on here. We have Ella the student chemist in her High School lab making some pretty crazy concoctions that are either dangerous, radioactive or explosive. The game looks fun and indeed is overlaid with a very catchy trance beat track to get you in the mood for the unusual occurrences that result from Ella's experimentation's. Games Warehouse is the developer that released the simply stunning Castles In the Clouds slot; what have they managed to concoct this time? We begin with 20 pay lines over the standard 5x3 format and the symbols appear stacked with Ella's pet the Purple Mutant the top pay at 8x bet for 5-of-a-kind down to the lowest card icon at 0.3x stake. There is a science symbol and a hazard one in between and 2 different mutant Bob Wilds can appear but only in the bonus free spins, not in the base game. The green chemical flasks on reels 1, 3 and 5 will trigger one of 3 bonus rounds, but before we get to those there is a random in-play Chain Reaction feature. After any losing spin this may occur and will give you unlimited free games until a win comes in. There is also a bespoke gamble feature where any win of 20x bet or more can be spun on a wheel. You will get either 150% of it, 50% or a mere 25% but can also get the bonus trigger and keep your stake too. You will be shown this once the qualifying win appears. At any time you can click on Ella in the bottom left and choose her attire - there are up to 7 different costumes for her, if that sort of thing appeals to you. Bob's Bonus - you spin a centrifuge with blue, green and red vials inside it and each time it stops you get the cash value in that colour vial. At the same time the coloured liquid gets added to 3 blue, green and red test tubes. If you fill one up it multiplies your wins that have gone inside it as follows: red 2x, green 3x and blue 10x. Good fun and can pay explosively! Radioactive Free Spins - pick a yellow radioactive container to reveal a number of free spins, at least 5, and then a blue one for the multiplier and red which will select which reel(s) will be locked in as Wild reels. Pick a high multiplier of say 5x and get more than 2 reels locked, and again could produce a favourable reaction! Bob's Replicated Wilds Spins - You get a fixed 10 free spins and on each at least 2 Bob Mutant Wilds are created which each turn random tiles into additional Wilds. Again a decent feature!